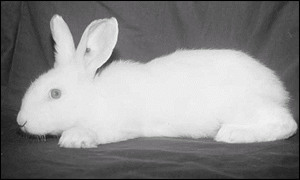 Rabbits are the latest animals to be cloned. French scientists from the country's Agronomy Research Institute (INRA) report the creation of the genetically identical animals in the journal Nature Biotechnology. They say such clones could be used to investigate the causes of human disease. At the moment, science tends to use mice or rats in this role, but Dr Jean-Paul Renard and colleagues believe rabbits might represent a better option because their physiology more closely resembles people. A tie-up with a biotech company will also see the researchers trying to get rabbit clones to produce pharmaceutically useful proteins in their milk. This sort of work is already being done in sheep, goat and cow copies. This practice of using animals as "drug factories" is known as pharming. To make their rabbit clones the INRA scientists followed the usual practice of fusing the genetic material from adult donor cells with eggs that had been emptied of their nuclear DNA. The resulting embryos were then brought to term by surrogate mothers. But there the similarities end. Dr Renard and colleagues say they adapted the established method, changing the timings of crucial events in the cloning process. In particular, they minimized the time that the fused cells were left in the presence of the chemical agents which are necessary to get the cells to start developing as embryos. They also identified the exact time-window necessary for implantation of the embryos into foster rabbits to get full-term growth. Nevertheless, like all other cloning experiments, the French work was very inefficient. From the hundreds of fused embryos used, only six live births were achieved; and two kits died shortly after coming into the world. The researchers say the four surviving clones have shown normal growth and two have shown their fertility by reproducing normally. The INRA team envisions cloning rabbits with certain genes "knocked out" so that identical animals that mimic particular human diseases can be supplied to labs in large numbers. These clones could be used, with the aid of information from the human genome project, to investigate the causes of ill-health and to find novel treatments. The scientists say the large size of lagomorphs (rabbits and hares) means they would be easier to work with than mice and rats. They argue experimental results would also be more realistic because rabbits and hares are, in evolutionary terms, much closer to primates than the traditional lab rodent. Researchers are also keen to get rabbits to produce drug molecules in their milk. Although genetically modified bacteria can "manufacture" simple human proteins, some of the more sophisticated molecules can only be made in mammalian cells. If scientists can succeed in adapting a rabbit so that it expresses useful chemicals in its milk, that animal can then be cloned to provide an identical line for large-scale production. "A female rabbit produces up to 10 litres of milk a year," said Marc Le Bozec, of BioProtein Technologies, the French biotechnology company working with the INRA team. "A sheep would produce several hundred litres, but 20 to 40 rabbits would give you the same amount. "The advantage is that rabbits reproduce so quickly. The pregnancy lasts one month, then it takes four months to sexual maturity and within six months you can have the first milk," he told BBC News Online. He said the company was already producing monoclonal antibodies in rabbit milk and these were being used in trials of drugs to treat kidney cancer and Hodgkin's disease. He said he hoped there could be products on the market within three to five years.